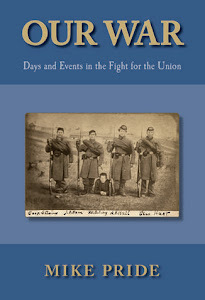 This blog is about my new Civil War history, Our War: Days and Events in the Fight for the Union. The statue that guards the Soldiers Memorial Building on a corner of the town common in Lebanon, N.H.
No landmark in New Hampshire better honors the sacrifices of the state’s Civil War soldiers than the GAR Hall on a corner of Lebanon’s town square. With my longtime friend and colleague, Mark Travis, I had the privilege of visiting this hallowed hall on Saturday. Soldiers Memorial Building, designed by a veteran. The occasion was the annual meeting of the Fifth Regiment New Hampshire Volunteers, a re-enactors’ group. Mark and I have known some members of this group for years. While writing My Brave Boys in the late ’90s, we took full advantage of their keen interest in the Fifth’s history and their authentic portrayal of its soldiers. Old friend Jim Blake, a longtime member, took the photos that accompany this post. We were all aware of what a special place we were meeting in. The GAR – Grand Army of the Republic – was the principal Union veterans’ organization after the war. It was founded in 1866 and dissolved 90 years later, when its last member died. Its lodge halls still grace many New Hampshire towns, but none that I know matches Lebanon’s. In particular, the upstairs meeting room there seems to be just as the old veterans of the Civil War left it. Known as the Soldiers Memorial Building, the hall was built between 1886 and 1890. A gleaming golden sentinel guards it out front. On the bottom floor are military artifacts, many in display cases. Upstairs, veteran photos cover the side walls and a roster of Lebanon men who fought in the war spans the front wall and wraps around its corners. 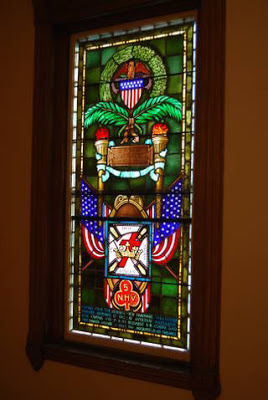 The building has gorgeous stained-glass windows, some memorializing the soldiers. One of the names on the roster is Ferdinand Davis, who designed the building. He was a 21-year-old Lebanon carpenter when he joined the Seventh New Hampshire Volunteers in 1861. Memorial window with 5th NH emblem at bottom. Davis’s papers are at the Bentley Historical Library at the University of Michigan. Fortunately for me, Alec MacGillis, a former colleague and now a staff writer at The New Republic, had a fellowship at Michigan while I was researching Our War. He graciously sent me copies of Davis’s letters and his memoir of his service. I used this material in chronicling the Seventh during the battles of Fort Wagner and Olustee. You can tell by Davis’s descriptions of buildings and fortifications, especially Fort Wagner, that he has the eye of an architect. After the war he married a Lebanon woman, and they wound up in Pomona, Calif., where he designed many buildings and residences. Mark Travis and I had too little time Saturday to look at everything inside the hall. We spent most of the mid-afternoon talking with the Fifth re-enactors about our books, his novel Pliney Fiske and my new history. But even though the building is seldom open, I'll jump at my next chance to explore it further. Capt. 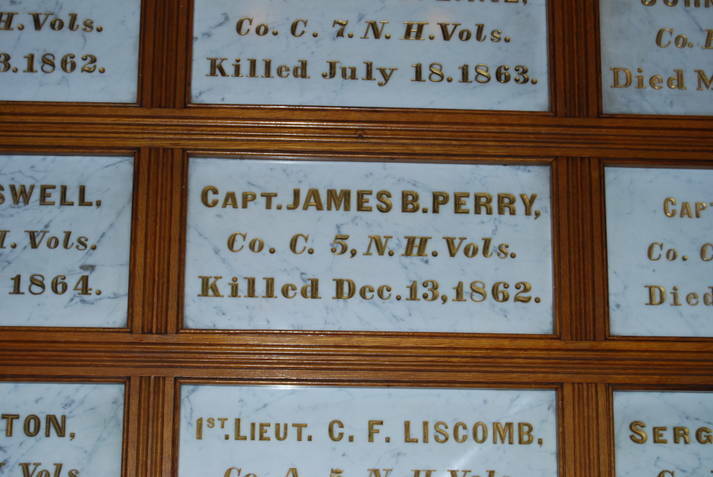 Perry's death at Fredericksburg was chronicled in My Brave Boys. In the roster on the wall, I did find the names of Davis and many other soldiers from Our War. Lebanon’s rich Civil War history is well-represented in the book. As I learned during my research, the town was the first destination for a particularly articulate squad of volunteers from Kimball Union Academy who joined a Ninth New Hampshire company in 1862. From the Seventh, Jerome B. 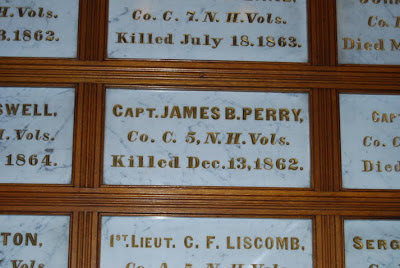 House and Andrew Lane, Davis’s company officers from Lebanon, were mortally wounded at Fort Wagner. (Their colonel, Haldimand S. Putnam of Cornish, was killed inside the fort leading the brigade that followed the famed 54th Massachusetts into battle.) Counting soldiers from the Fifth whom Mark and I had written about in My Brave Boys, I knew something about a dozen or more men named on marble plaques on the wall. All in all, what a memorable day among old friends inside a little-known New Hampshire gem! Mike, what an interesting blog. It was back in 1972 that my wife and I spent a day around Penacook looking for information about our ancestors who lived in Boscawen. We had no idea that we had family members that had served in the war. Now we can't wait to get back and see more of the area. We have sons- and grandkids- living in Maryland, so we will be on the East Coast in the spring. Thank you for your observations and enthusiasm. My first visit yesterday. I will need more time to spend there and hope to find out that the administrators have some kind of visitation opportunities for the public. Hidden Gem, no doubt. I am a historian and author who lives in Concord, New Hampshire.